Applying for commis chef jobs in London can be a daunting experience with many companies to work for. Furthermore there are lots of chef agencies to join and work with. 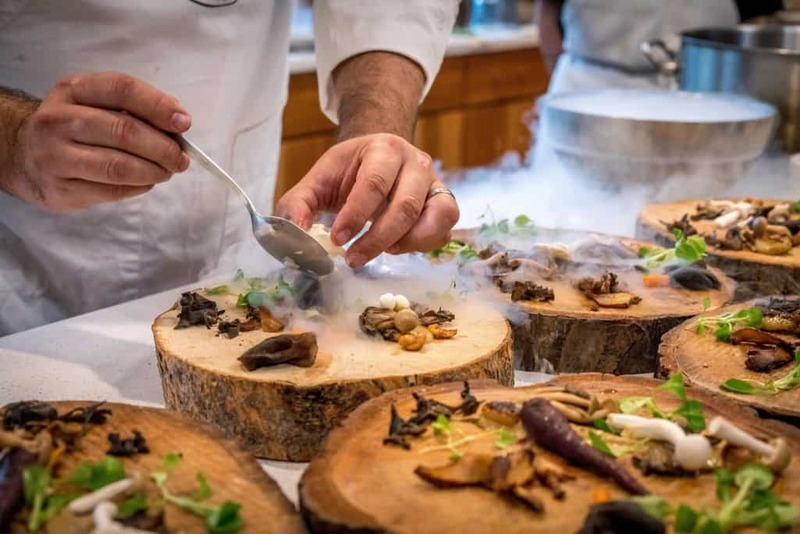 There are many hotels and restaurants in London looking for commis chefs, and what we do is find the options out there to get your career on the right start. Firstly, we have a whole library of information available to help you with getting the most out of your commis chef journey. And also at one point in time all of the best chefs out there were commis chefs. Gordan Ramsay and Jamie Oliver were both commis chefs at the start of their careers. Gumtree can be a good resource to find a commis chef job in London. On this site jobs can be found and getting an interview can be done pretty quickly. Con’s – many of these jobs have a high turnover of staff and it’s always a good idea to research a company before committing to a career with them. Hence a search can be done by entering the keyword ‘commis chef job’ Location – ‘London’. A Monday to Friday job can be very appealing to many chefs. These jobs are great if you prefer weekends off with family or friends. These jobs can be found in the City of London and with many event caterers out there. The food may not be at the highest standard, with most high-end restaurants open every day. With event caterers, weekends may need to be worked during busy periods. However, overtime is paid in many places. For An Ambitious Commis, A Job In A Michelin Star Restaurant Maybe Suitable. suitable. London is a great place for high-end food. There are many restaurants in London who are at the top of their game. With one, two and three star restaurants all in London. 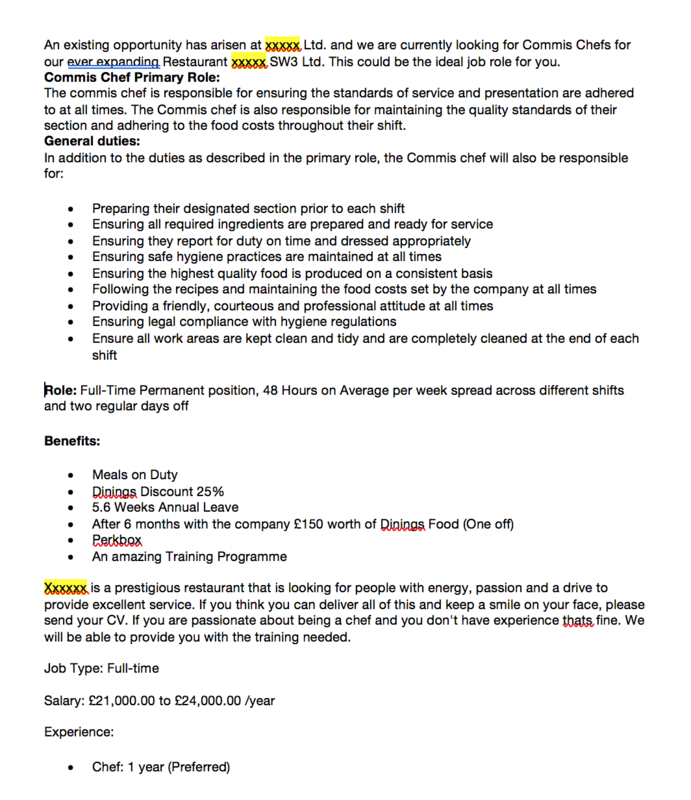 Part-time jobs as a commis chef may be suitable. Many places will employ commis chefs on a part-time basis. Working weekends for example. This is one option for a commis chef at a catering college wanting to work weekends for experience and to get paid. All kitchen brigades have a turnover of chefs, and these chefs need to be replaced. This is the same as any other job really. Personally, I have worked with maybe 500 – 600 chefs over the 20 years I have been a chef. The national statistics for 2017 show that there are 269000 chefs employed in the UK. Many chefs stay in a position for around 1 – 2 years. This results in a massive turnover of chefs in the UK. For this reason, the chef career can offer great potential for a commis chef ambitious for a promotion. Owners of hotels and restaurants rely on enthusiastic and passionate chefs. The chef career is one of the most in-demand careers out there. There hundreds of kitchens in London who are desperate to employ chefs as good-quality loyal chefs are needed to create great food. The kitchen brigade is a common system used in many professional kitchens. There are different levels of chefs from the commis chef up to the head/Executive chef. Although the number of chefs in each position depends on the overall size of the kitchen brigade. The head chef has the overall running of the kitchen. The jobs of a head chef can include hiring and firing staff and writing menus. The sous chef works alongside the head chef. Many of the sous chef and head chef jobs will be similar. With the sous chef taking on the jobs in the head chef’s absence. The chef de partie will be running a specific section in the kitchen. This can be the larder, sauce or fish section. Managing junior staff, preparing and cooking food and stock rotating. Commis chefs will be working on the basic jobs in a professional kitchen. In professional kitchens, all chefs would have started as a commis chef. This includes chefs who have completed formal qualifications at college or online. This starting role is the position where all the basic skills will be practised, learnt and improved upon. A commis chef just starting out in the kitchen will be responsible for the basic jobs. To follow is a list of jobs that may be expected of a commis chef to do. There is a broad range of potatoes that are used in recipes. Commis chef will need to learn and understand the potato. Varieties include: ‘Maris Piper’, King Edward and a sweet potato. Common jobs include the peeling of potatoes and mashing. A speed peeler is a great kitchen tool for the peeling of potatoes quickly. Varieties of onions include Spanish onions, red onions and shallots. A commis chef will need to learn the different types and how to peel and prepare them. Practice the different onion cutting techniques to build up a stable foundation of cooking skills. Spinach will need to be picked and washed well before being cooked. Always remember that spinach cooks down a lot. This means a big bunch of raw spinach will transform into a small amount after the cooking process. Do not over salt at the start of cooking. The picking and washing of salad is a common job of the commis chef. There are many different types of salad which include: Lollo – Rosso, oakleaf and baby gem. Pick out bad salad leaves and be gentle when washing and drying the leaves. Commis chefs will be organising fridges, stock rotating and cleaning section fridges on a daily basis. Vegetables are going to need peeling, cutting and cooking. Commis chefs can practice their cutting techniques for speed and accuracy. There are many herbs that are used including, parsley, basil, thyme and rosemary. Jobs include picking, washing and finely cutting for dishes. This is a typical job advert for a commis chef position in London. The job description needs to be researched your application for the job can then be tailored around the job description. Highlight the keywords being asked for and build a CV around these keywords. Always be honest about your previous experience and do not lie. You may get caught out in the end and this can lead to disciplinary procedures. The commis chef is the most basic position in a kitchen brigade. A starting salary can vary slightly depending on location and the standard of food being cooked. And also, a commis chef with experience can earn more than a newbie. All professional chefs start off as a commis chef, there is no reason not to have an ambitious vision for your chef career. And the natural progression for a commis chef is a move up to the chef de partie position. Certainly, this is the position all commis chefs need to aim for, once at the chef de partie position a lot more doors can open up for the chef. Progression of a commis chef can vary depending on the skill, and dedication of the commis chef. Maybe a commis chef will stay in this position for around 3 years or until all the groundwork is done that is needed for a successful career. Highlight the keywords being used and build a cover letter and CV around these, do not lie. Do some research about the company before the interview. Be smart and act politely and it’s not a great idea to be smelling of alcohol or cigarettes in an interview. Practice in front of a mirror answering questions. Possibly set up an interview roleplay with a friend and practice the interview. The more prepared you are for the interview the better your chances are of success. Chefs can work in many venues in London such as Buckingham Palace which has its own kitchens. And with many banqueting events being held here. London has some of the best hotels in the world: the Savoy, the Ritz and the Dorchester (3 Michelin star restaurant Alain Ducasse at the Dorchester). Premiership clubs in London include Chelsea, Arsenal and Tottenham. These clubs all have their own kitchen teams and offer a great opportunity for commis chefs to learn and develop their skills. as you wish. I hope my article has given an overview of the job and has answered many questions that you may have. If you have any questions just pop an e-mail over to me and il get back to you. We have contacts within the industry who are looking for commis chefs to fill positions every day. You may already be in a job that you are not satisfied with. Or even looking to move to the UK in the near future and need some help in finding your first commis chef job. Sign up for the CV templates to get on our list for upcoming commis chef jobs in London.